Our stunningly beautiful marble worktops in Irby glisten and shine in the lights of your new kitchen. The colour array is almost endless and there is enough choice to suit any kitchen no matter the colour palette. Stone worktops are the ultimate in kitchen practicality and elegance. The simple sophistication of marble is in the veining of the marble stone which is immediately recognisable. The marble stone is a metamorphism of limestone or dolomite. The wonderful characteristic swirls and veins in the light coloured stone are caused by various minerals that are present as grains or layers in the rock. Marble is strong and resistant to damage but over many years it can be re-polished to keep the surface pristine for many years. There is a choice of material available when you are fitting a new kitchen. In Irby, marble worktops have a number of benefits over other stone countertops. Marble is a softer stone than granite but infinitely more beautiful. Both stones should be sealed to prolong the life and durability of the stone. The marble worktop remains clean and hygienic with a light wash with gentle dish soap. The installation of marble worktops is done by our expert team as the stone is heavy and can be chipped if dropped. If you are looking for the last word in luxury then marble is the stone you should choose. We design and create some of the best marble worktops in Irby. Contact David Williams today to set up an appointment with us. 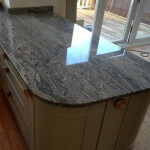 We make sure that we visit your home to find out what you are looking for and to see the space available for worktops. David Williams is a fully trained, time served stone mason which is sadly a dying trade. He has been specialising in handling stone for over 50 years and knows exactly which stones are best for the task. He is very experienced and buys in only the highest quality material. Our marble worktops are competitively priced and marble can be used in the bathroom as vanity tops or bath surrounds. We can design and manufacture anything you require out of marble, granite or quartz. This entry was posted in Marble Worktops and tagged Irby Marble Worktops, Marble Worktops in Irby. Bookmark the permalink.